Things I learned on Summer vacation! 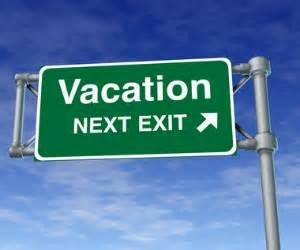 Have you ever returned from a vacation and felt so worn out and overwhelmed with what you have to do when you get home that you have said, “I need a vacation from my vacation”? Well I sure have and this time was hands down the easiest transition from vacation to real life I have made yet. Our Summer vacation went pretty darn good if I do say so myself. But, as always we did learn a few things that I felt needed to be added to my list. Especially since we travelled a long way, in a car, with a baby and teenagers. Who knows, I just may add more as I think of them but for now here is what I have for now. Try not to over plan activities for every day you are there. – Leave room for spontaneous outings. We went with many people in mind that we would like to visit or meet up with while we were there. Things come up and you can’t always get together. Several of the plans fell through but we really didn’t have set days and times so it left us open for other things. Be touristy – Even if you are going back to a place you were born and raised, go do the things that tourists do and see the sights from an entirely different perspective. You won’t be sorry, besides it is fun to be able to share the memories you had when you visited places as a child to your kids when you revisit with them. Don’t judge a hotel chain by it’s name.- We stayed in a hotel (which will remain nameless) that is part of a big chain. we had stayed in the same named hotel here where we live now and absolutely LOVED it. But, the hotel on our vacation left us a little sad that we couldn’t expect the same level of service, quality, and cleanliness in another state. Overall, it was a good hotel and some of the things were just plain laziness on the part of the staff there, but still it leaves an undesireable wrinkle in their image. Do your laundry before you leave to come home.- This was huge for me. We stayed in a hotel that had washer and dryers and because we were there for almost 2 weeks and there were 6 of us this was a welcome sight. We did laundry a few times and believe it or not just taking a break from being touristy, visiting friends and family, or just going for a drive to see sights was so nice. We kicked back on the patio of the hotel and had an adult beverage what we now call “Laundry Beer”. The key is that the day before you are to depart for home, take the day off and do your laundry, pack it all up when you are done and when you come home…..voila you can just unpack and put it all away. I know for us the last thing we want to do is laundry when we have driven so long. Take a guided tour – Even if you only do this once on your trip it is so worth it. We took a duck boat tour in Boston 2 years ago and we did it again this time. Both were separate and amazing tours and we learned something each time. Plus it was fun!! Someone else doing the driving, and you just have to sit back and enjoy the scenery or take photos. Read reviews before hand- This one is similar to the hotel, but this is more for restaurants. We were in a city with lots of different restaurants within walking distance of our hotel. We only went to 1 of them and it was right next door and it was fabulous. We read reviews on several places that I had not been to before to see if it would be something we would like. The things we looked for when choosing were wait times, if the staff was friendly, what kind of food and how authentic it was, family oriented, dress codes. Because nobody wants to go to someplace that looks casual but ends up being more fancy on the inside. We tend to stick to places we know or places that our trusted friends and family recommended for us. Make sure you wear the kids out – Our kids stayed in a room with their older sister and if we didn’t do much walking or traveling for a day, they were a little off the wall in the evenings. So with the hotel we were at, there wasn’t a pool but there was a basketball court and they would let you use a basketball from the front desk. This was great especially for my ADHD son who a couple of times went out and shot hoops for awhile to wear off some energy. (the heat helped wear off that energy a bit faster I must say). Try and eat some veggies while you are gone- Needless to say, we just don’t poop right when we are away from home. Long drives in the car, eating foods that are generally not always the best choices, not drinking enough water since we don’t really want to stop at every rest stop to pee. Have a salad with your meal or get some local fruit or something. Nothing is worse than being constipated on a trip or blowing out a hemmorhoid because your poop is so dry. (I know…a bit TMI but it is a fact of life people…..if you deny it you are lying). Leave on a Sunday and come home on a Sunday – This one was huge lesson for us. Driving out to Boston we left on a Wednesday. Mid week, plenty of road construction the entire way. Lots of stop and go traffic and people being stupid causing accidents which slow traffic down more. But our drive home taught us that leaving early on a Sunday morning, we drove almost 900 miles without any real slow downs. (The DOT doesn’t generally do road construction on weekends, especially Sunday) Which allowed us to make great time getting to our first hotel stop, where we actually had time to go out and have a meal and relax in the Jacuzzi tub for awhile before we had to go to sleep. HAVE FUN DAMMIT!!! This list is not a bible or a must do checklist. Just a few things I learned along the way that if you haven’t already thought about it, might just make sense to someone. Sure some things take a bit more planning and initial investment of time but, in the long run just make memories and enjoy being together. Sharing experiences with my family is special to me. Even though various times I was ready to lay the smack down on a kid who was pouty or just being a butthead, we still managed to move past it and have fun. Back from vacation and it feels so good! Great tips!! Very timely as I’m now on vacation! Enjoy your vacation, having fun and making memories is the most important. Thank you for the advice!!! You are very welcome!! 🙂 Thanks for reading and commenting!